The festive run-up is a great opportunity to snag new customers who could turn into regular buyers. Go the extra mile with these five quick packaging tips. During a season when we’re all looking for something a bit special, adding a few extra flourishes to your outgoing mail can mean the difference between Holiday cheer and festive drear. Premium packaging also helps make your brand memorable, and can go a long way towards cementing customer relations into the new year. Here are five easy and creative packaging ideas to add the wow factor to your sales this season. Attaching a gift tag to your holiday packages is a small but effective touch to help make customers feel wanted. Our Square Cards can be turned into tags with a message as short and simple as ‘Happy Holidays!’ or something tailored to your business. 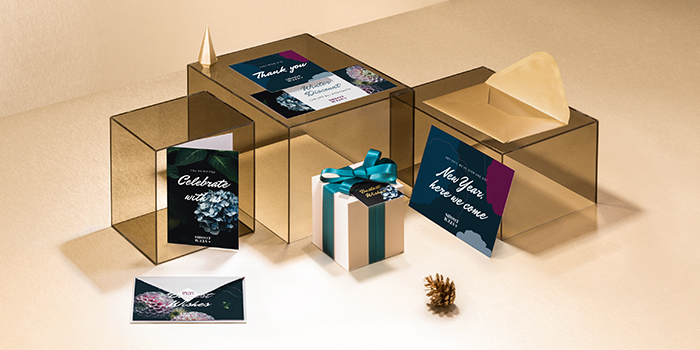 Customizations such as gold foil can also add an extra bit of festive glamor. You could add a gift of your own to your tags – such as a discount or free gift for customers who return in the new year. Or, if you’re feeling generous, you could include a pack of printed gift tags to each order help customers with their gift wrapping. Pumpkin pie, a bauble – our round Stickers are the perfect shape for all sorts of festive designs, while squares and rectangles can be printed to look like parcels. Add a Sticker to the outside of your holiday season parcels for a festive touch, or add your business logo or a personalized message, and use them to seal envelopes. You could even spread the love by adding a small sheet of holiday Stickers to each order for customers to use in their wrapping. These don’t have to have your brand name on them – the gesture alone should be enough to let word of mouth do the talking. Stickers can also serve as a tool to make sure your customers don’t forget you once the ball’s dropped. Why not add the start date of your January sale to some Stickers and slap them on all your outgoing mail? You can also use them to remind customers of something special about your business, such as your eco-friendly credentials. Hopefully, it’ll help you stand out from the avalanche of mail everyone receives over the holiday season. Round robins and photo cards are a holiday staple – but why should they be restricted to friends and family? If you’ve achieved things in 2018 you want to to shout about, personalize some Greeting Cards by adding a friendly team photo and a quick update on what your business has been up to, then slip one inside each delivery. Add a touch of humor, give your design some colorful stand-out, and print it onto our 340gsm, extra-personal Greetings Cards, and your customers might even be tempted to hang it with the rest of their hoard. Or, to make shoppers feel even more valued, offer a free mini-print Postcard with each order placed over the holidays. The principle of reciprocity means that shoppers who receive a gift will feel like returning the favor (hopefully by continuing to buy from you). With the option of printing a different image on every Postcard you order at no extra cost, you could even offer them a choice of design at the checkout. Repeat orders a gift for any small business, so show your appreciation with a handwritten thank-you note. A Flyer or Postcard that shows you’ve noticed your customer’s loyalty over the past year – and that rather than being run by elves, there’s a real person behind your business working their Holiday stockings off – will really make an impression. Our Flyers and Postcards are both available with a matte finish, giving you space to show off your designs on one side and write a personal note on the other. You could use the moment to add some gifting advice – a friendly, ‘It looks like you’ve been buying gifts for children. Have you checked out our personalized posters?’ could draw customers back to your site. If you add a Business Card to each of your orders – and if you don’t, why not? – switching to a festive theme during the holidays adds a professional touch to your packages. Business Cards also make great gift tags for larger parcels that might swamp a Mini Card, and can be used to hold useful information your customers will thank you for – print your Business Cards with key holiday shipping deadlines, and it’s more likely to be pinned to the fridge than tossed aside. Feeling inspired? Shop the range. Design and print customized Square Business Cards at MOO. Upload your images, logos and more to make your business cards reflect your style.